Modern orthodontics are not for children and teens anymore! As a matter of fact, 40% of orthodontic treatments performed are for adults. Unlike juvenile orthodontics, adult treatment can take months not years. We have many options to improve a smile and correct crowded or misaligned teeth. Modern materials and technology allow all the procedures to be discreet (no more “mouth full of hardware”), comfortable and fast. Dr. Lipetsker offers the best adult orthodontic treatments in the metro-Boston area. You deserve to love your smile. Schedule your consultation appointment today. To learn more about Invisalign please visit their website. 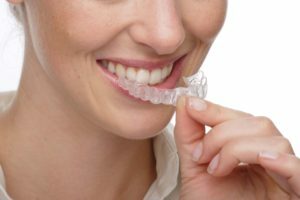 To see if Invisalign would work for you please schedule your consultation with Dr. Irene Lipetsker. The newest of the orthodontic procedures, 6 Month Smiles offers orthodontic treatment, as the name suggests, in an incredibly short time. And you can look good while working on your smile as the braces and wires used are nearly invisible – just take a look at this picture of a happy 6 Month Smiles patient! 6 Month Smiles system truly is an effective, safe and affordable cosmetic solution that fits your lifestyle. If traditional braces are the best option for you, Dr. Lipetsker can use small, clear brackets that eliminate that “metal mouth” look commonly associated with having braces. Traditional braces may be the best option in cases of severe crowding, especially when avoiding extraction.